A watch is not merely a tool to show you the time, it is a way to express your personal style. If you enjoy wearing watches and you have an urban chic style, we have found the right brand for you. Created by Giorgio Armani fashion house and inspired by the street-chic culture and dance music, this brand embodies the youthful spirit of the new generation. Read this detailed review and find out why this brand is the best fit for you. 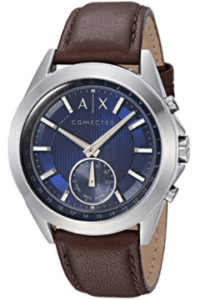 What makes this watch so classy is the brown leather strap that is combined with the latest technology. It looks traditional but has so many advanced tech features. 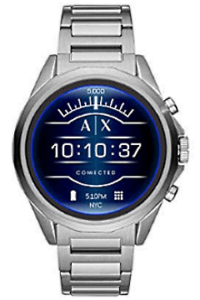 For example, the watch connects to your smartphone through wireless and is compatible with both Android and iOS devices. The AXT1010 has a case diameter of 44mm and a Quartz movement. The fact that it is water resistant can allow you to go for short recreational swimming without having to take it out. But as expected, avoid using it for diving or snorkeling. Since this watch is able to connect to your smartphone, it’s always accurate and automatically changes the time zones when you are traveling. It also has a microcontroller. This hybrid smartwatch has a stainless steel and a case diameter of 44mm. Its gold-tone makes it look very modern and matches many styles. Similar to all above-mentioned watches, the AXT1008 is compatible with both Android and iOS devices which means that you can connect it to your smartphone and use it for many things. You can check your messages as well as take pictures and always know the correct time because this watch adapts to its time zone when you travel. The watch features Quartz movement and is also water-resistant. Same applies here – avoid wearing it when diving because it’s water resistant only in water up to 50m. Otherwise, feel free to use it when you are going for recreational swimming for a shorter period of time. This type of blue silicone hybrid smartwatch has so many options that if you connect it to your smartphone, you will be able to control the music you listen to or even take photos. Once you wirelessly connect your AXT1002 watch to your phone, you can start, stop and skip the music track you want to hear. If you have the A|X Connected App on your smartphone, you can receive texts, likes or any types of messages on your watch and take snap photos without any selfie-sticks. 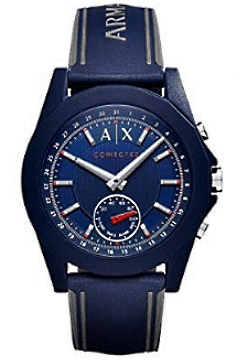 The watch also boasts a 44MM round case and a microcontroller, and of course, it has the main feature that any watch should have – to always tell the correct time. The A|X Connected App is compatible with both Android and iPhone devices. One great feature that this hybrid smartwatch AXT1007 has is the fact that it’s water resistant. It can be underwater up to 50m and it is suitable for a short period of swimming. Of course, don’t use it to go snorkeling or diving, it might get damaged if it’s in water for that long period of time. The case of this watch is 14mm thick, has a size of 44mm and bandwidth of 22mm for maximum protection. This watch has Quartz movement and a case diameter of 44mm, a feature that makes for perfect visual clarity. This one also has a microcontroller and can also connect to your smartphone wirelessly. The black tone gives it a nice look and goes with many outfits. When looking for a watch that seamlessly connects modern style with technology, look no further than this AXT2000 model. 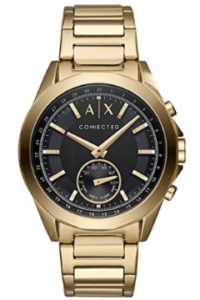 This watch features a touchscreen and is made of stainless steel for maximum strength and durability. It is compatible with iOS as well as Android smartphones which allows you to check all your messages on your phone and even check your heart rate. You can make payments using your watch and its water-resistance specs make it appropriate for recreational swimming, not for diving. Another great feature that this watch has is the rapid magnetic charger which comes with the purchase of the smartwatch. However, you should always avoid charging it with a different charger. It has an estimated battery life of 24 hours depending on how much you use it. Lastly, it also comes with a user guide so you are able to quickly learn the ropes and begin taking advantage of its amazing features. 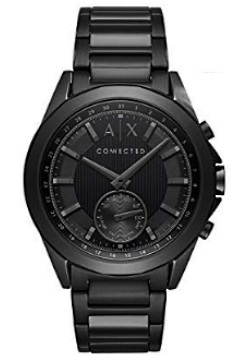 Taking a look at all of these models of Armani Exchange smartwatches, you can conclude that they are all very similar in their functionality. The main difference is in their design and look. Wouldn’t you like to have a watch that can be connected to your smartphone and make your life easier? Well, all you need to do is choose the watch that matches your style the most and complete your urban look.